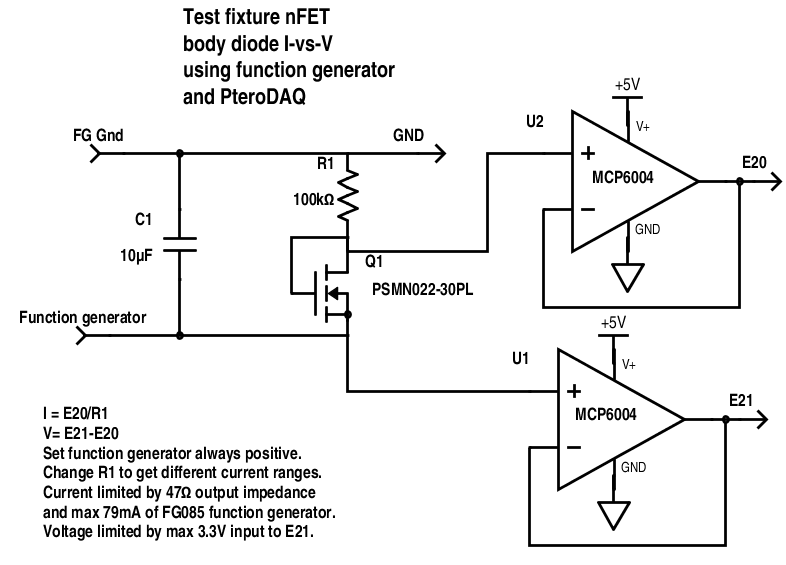 Circuit for measuring I-vs-V characteristics of nFET. 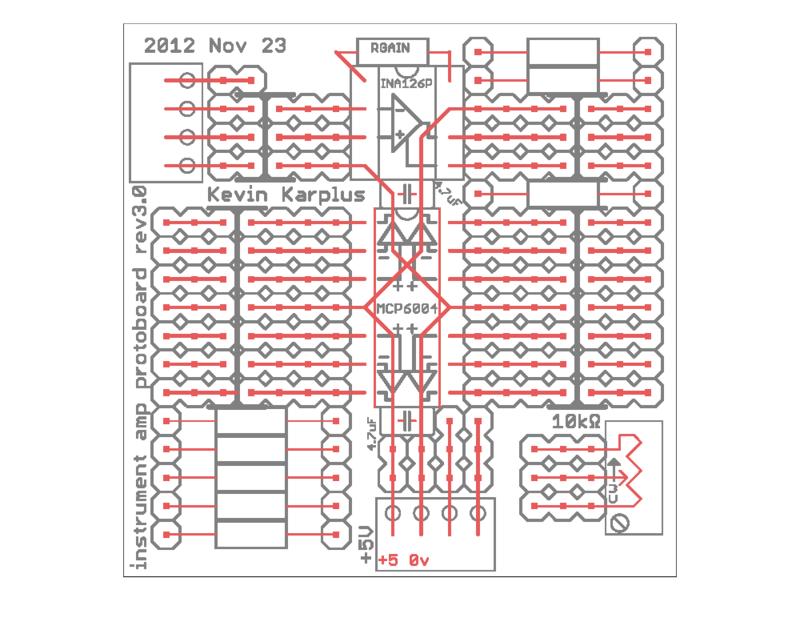 The circuit is essentially the same, but some of the wires are swapped to make measurements all be in 0–3.3V range. The leakage current around 6nA may be from the breadboard or ADC—note that the load resistor here is an open circuit, getting about 170MΩ resistance from the breadboard or the KL25Z ADC inputs. 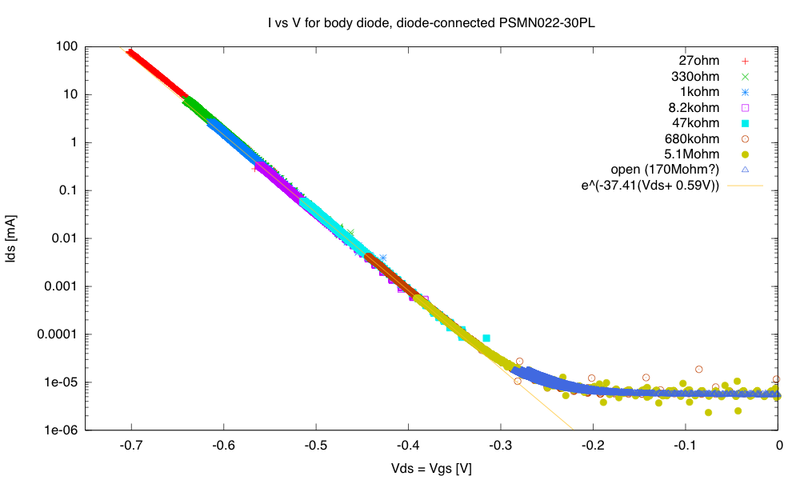 To get the straight lines to fit so nicely, I had to do two things: throw away any points where E20 was less than 5mV or E21 was greater than 3.29V (the voltages may have been going outside the ADC range of 0V–3.3V, and the last few counts at each and of the range are always a bit suspect), and subtract a tiny offset from the E20 voltage (1.2mV). Both currents are show as positive, for convenience in plotting (as the KL25Z only records positive voltages—I swapped leads on the function generator to examine negative swing. 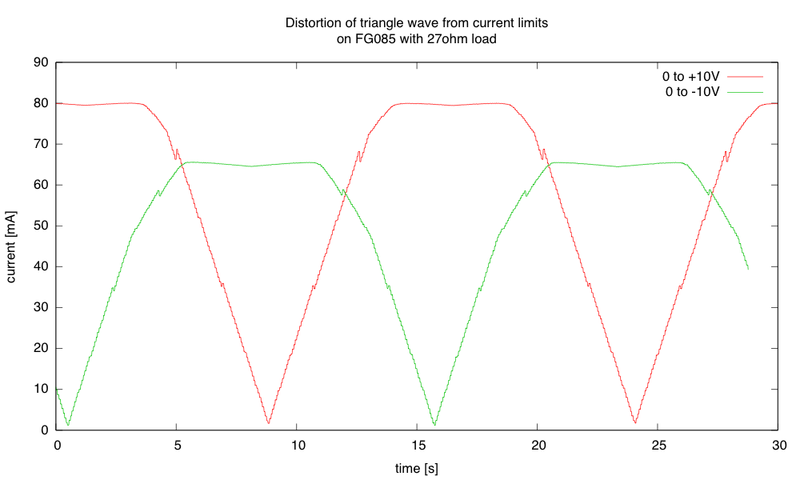 The triangle waves, which look ok with no load or with large impedance loads, get very distorted at high currents. For triangle waves going positive, the current starts getting limited at about 72mA, and strong clipping kicks in at about 80mA. For triangle waves going negative, the current starts getting limited at 50mA, and strong clipping kicks in around 65mA. The clipping actually gets stronger as the voltage of the source attempts to rise further, so the waveform isn’t flat on top but dips. With a 3Ω load, the ultimate current limits are substantially higher. For positive wave forms, the limitation starts at around 74mA with strong clipping at 93mA, and for negative transitions limitations start around 52mA with strong clipping at 80mA. The values where the current limiting starts are about the same as before, but the strong clipping limits have gone way up. 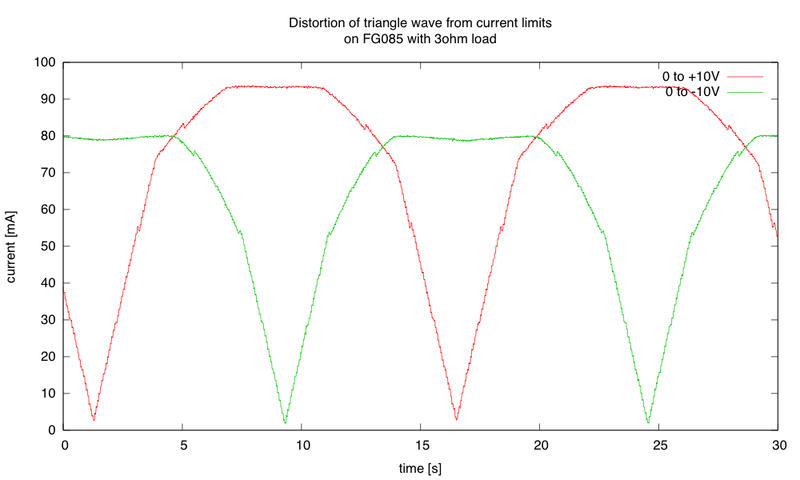 It is probably reasonable to treat the FG085 as really having either ±50mA current limits or –50mA,+72mA limits. The specs for the LM6172 op-amp that drives the output is typical ±60mA, min ±50mA, so treating the limits as ±50mA seems reasonable. Note that the bad glitches from the cheap fake DAC used in the FG085 are very evident in these plots—the glitches are at each of the high-order bit transitions, with the really big glitch in the middle of the output range (switching from 0x7F to 0x80). The glitch there is about 3.2LSB (that is, the voltage for 0x80 is slightly less than for 0x7D), which is really terrible for an 8-bit DAC. The 0x40 transition has about a 1.5LSB glitch, and the 0x20 transition about a 0.7LSB glitch. Using a cheap DAC0800 multiplying DAC would have added about 50¢ to their parts and assembly cost (a big deal for a $50 retail product), but allowed them to increase the sampling rate and avoided the non-linearities. Switching to a better microprocessor (like the KL25 from Freescale could have gotten them more bits, better linearity, and a fast sampling rate at no higher parts cost than the ancient ATMega processor they chose). I noticed one other problem with the FG085 function generator when doing these measurements—the buttons have very weak springs and often don’t return after being pressed, because the caps rub against the holes in the panel (they made the holes a bit too small or used buttons with crummy springs). If the button stays down, subsequent button presses look to the firmware like the earlier button pressed again. I often had to flick the button back up by pressing it up from below the panel—not an ideal user interface! The lecture between the halves of the first op-amp lab did not cover much material. A big chunk of the first part was a discussion with the class about whether we should have a midterm quiz. After much discussion of the advantages and disadvantages of different approaches, we finally decided that I would give them a take-home, ungraded quiz, so that they could test themselves and later ask questions in class for things they needed more help with. This discussion also brought out some suggestions from students of additional resources that they had found useful (Khan Academy videos, the new edition of Horowitz and Hill, and the All About Circuits web textbook). I also got a chance to give them some reassurance that they are doing well, since some are getting discouraged. I’m packing a lot into the class, and it is easy for the students to get overwhelmed—especially since some are just now getting to capacitors in their algebra-based physics classes. Switching from a symmetric dual power supply to a single power supply. 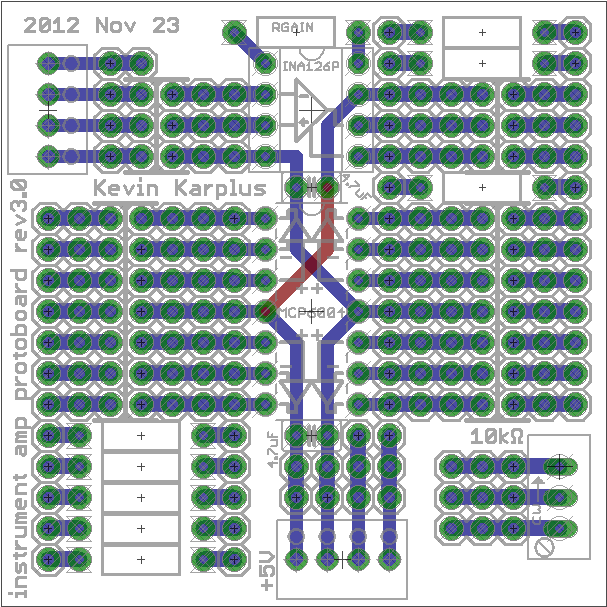 Paralleling two op-amp chips to get twice the current capability. Adding a potentiometer for variable gain. Adding a unity-gain buffer to separate the loudspeaker driver from the gain amplifier. 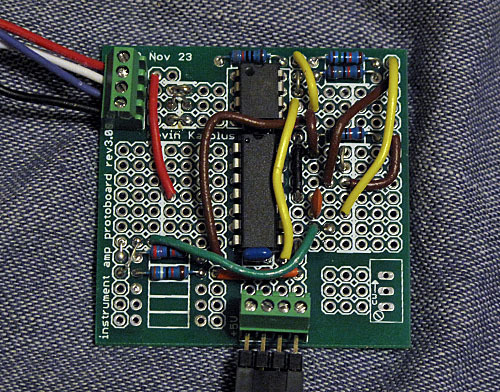 Adding a tone-control circuit, like the Baxandall tone control on http://www.learnabout-electronics.org/Amplifiers/amplifiers42. They can’t use exactly that circuit, as they have only 10kΩ potentiometers, not 100kΩ ones. The idea can be adapted, or the students could do simple treble-cut or bass-cut circuits. Using a loudspeaker as a microphone. I think that should work, as I get about a 500µV signal from my loudspeaker when I talk into it. The don’t need any DC bias for the loudspeaker mic, and they may even be able to eliminate their high-pass filter, as the loudspeaker mic can be set up to have its output already centered at 0V. I also suggested hooking up a plug to the output of a music device, investigating how the amplifier clips, and hooking up a function generator (with a voltage divider) to replace the input and high-pass filter so that gain can be measured without the difficulty of varying sound level in the room. The point of the lab (after they’ve done a good job of explaining how they designed the basic amplifier) is to get them to play with the design—to do something they see as fun. I also talked about why some student had been seeing asymmetric clipping when they hooked up their loudspeakers. 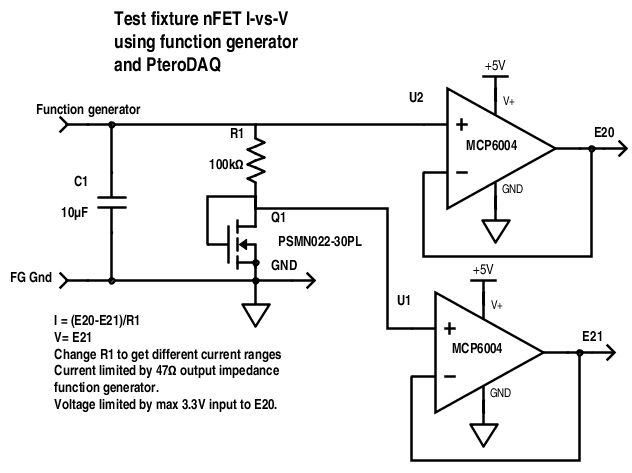 The key concept (which they had not had) is that the input-referenced voltage offset could be as large as ±4.5mV for the MCP6004 op amps that they are using. With a gain of 50, that makes an output offset of up to ±225mV, but with an 8Ω loudspeaker the current limits cause clipping at about 200mV, so the output signal could be shifted far enough so that half of it is clipped, even it all looks like it should be in range. I talked a little about the possibility of doing offset nulling, but didn’t really give them a circuit that they could use. In lab today, people did seem to be having a lot of fun, and both morning and afternoon sessions ended early. I’m looking forward to reading the design reports this weekend, because they should be different in interesting ways, as different students chose different directions to explore. I helped a few students debug their circuits (as usual, the most common problems were loose wires, power supply not providing power, and scope probes set differently from what the oscilloscope thought). Students not reporting the models they were fitting to the data. Students not reporting the parameters of the fits after doing the fitting. Omitting leading zeros before a decimal point. Numbers should never start with punctuation. After that brief intro, I worked with the students to develop a block diagram for an audio amplifier using the electret microphone and loudspeaker that they had already characterized. This had been part of their homework, but I expected them not to have really grasped the point of a block diagram. Another thing I went over in class, because I’d seen problems with it in previous reports and prelabs ,was reminding students that V=IR is not a ritual magic incantation. Reciting it doesn’t make solutions to problems right, if it is just randomly applied. I reminded them that the voltage has to be across the resistor that the current is through—picking random voltages or currents in the circuit is meaningless. I showed them an example taken from the prelab they were turning in at the end of class. 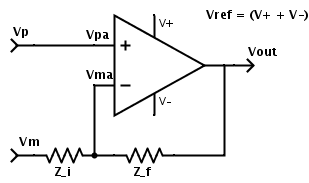 The V=IR error was very common, mostly with V was taken to be the power supply voltage, rather than the voltage across the resistor that biases the microphone. Students also had a lot of trouble with computing the AC voltage of the signal out of the microphone, based on the loudness of the sound input and the sensitivity of the microphone. I knew this was a difficult assignment, but I thought that it would be relatively easy, because they had supposedly already created a worksheet for themselves as part of Lab 4 (the microphone lab). Either they forgot everything they learned there, or they never really got the idea of the worksheet they created. One student asked in class on Monday, quite reasonably, for a worked example. I’m going to have to come up with one that doesn’t just do all the work for them—I know these students can fill out worksheets, but what I need to get them to do is to solve problems when the steps aren’t all set out for them. The afternoon lab section (many of them working together) did much better on the prelab than the morning section—the difference between the sections has been noticeable from the beginning, but it seems to be getting bigger, not smaller. For some reason the descaffolding is working better with the smaller section. Individuals in the morning lab are doing quite well, but there are more floundering students in that section, and I don’t know how to get them back on track. I’ll talk about some of these possibilities in class tomorrow (plus stroking the students a bit about getting the lab done quickly). I attribute he good performance on the lab to them having put in more time on the prelabs, even if they didn’t get the answers to the questions exactly right. Thinking about the design ahead of time (and getting a little feedback) goes a long way toward clearing up confusion they have had. Instrumentation amps with a strain-gauge pressure sensor (measuring breath pressure and blood pressure using an arm cuff). Will need to be 2-stage, since the INA126PA chips we are using aren’t rail-to-rail amplifiers. Transimpedance amplifier fora photodiode to measure pulse. This will also need to be multistage, since the first stage will have to have limited gain to avoid saturation. After high-pass filtering much more gain will be needed. Class-D power amplifier. This is always the toughest lab of the year. Even small mistakes can result in shoot-through current that gets the FETs hot enough to melt the breadboards (I have two breadboards that I’ve melted holes in). EKG using only op amps (making their own 2-op-amp instrumentation amp, plus high-pass filtering and a second gain stage. They’ll be using all 4 of the op amps in the quad op amp package for this amplifier. I’m about a week behind on grading redone assignments—weekends are spent grading design reports, Monday nights grading prelabs, weekends plus Tuesdays adding to the book a chapter ahead of the students, and I squeeze in the redone assignments Wednesday or Thursday night, if I don’t crash too early.